Creekside at Bethpage is a new 55+ community in Durham, North Carolina. Well-known builder AV Homes offers active adult homebuyers a great selection of low-maintenance single-family homes. This one-of-a-kind neighborhood will consist of 650 homes nestled within the scenic Briar Creek community. Residents will also be able to enjoy a lavish clubhouse with resort-style amenities and plenty of events and activities that will allow them to live a vibrant and social lifestyle. Located in Durham, North Carolina, residents will have easy access to everyday conveniences and major highways. Residents will never be far from attractions and entertainment as well as top-notch medical facilities. An envious line-up of amenities exist at Creekside at Bethpage. The 13,000 square-foot Hemingway Hall contains everything that residents could want and need to stay physically fit and socially active. 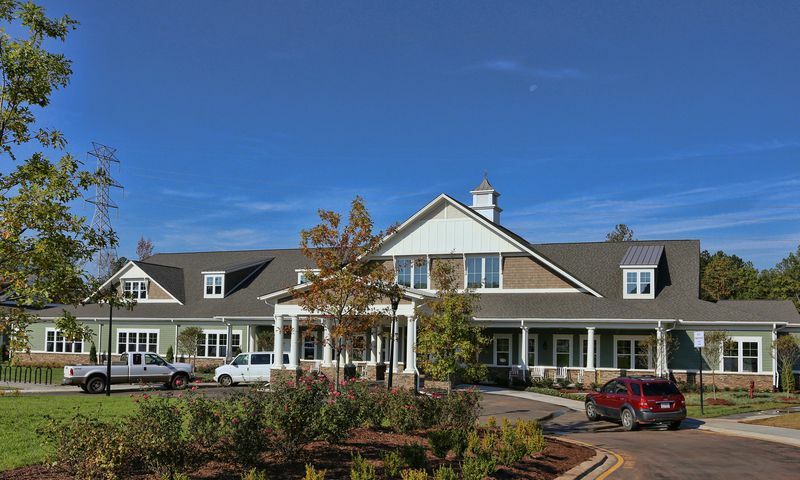 Creekside at Bethpage's clubhouse contains social rooms and a hobby and game room for fun activities and events. It also includes an arts and crafts studio, amphitheater, computer center, billiards, and a fully equipped fitness center with an aerobics and dance studio. AV Homes thoughtfully designed this 55+ community with amenities that will keep homeowners active outdoors. These include a swimming pool, tennis, bocce ball, and pickleball courts as well as lawn bowling and gardening plots. This scenic neighborhood also features walking and biking trails, ponds, and plenty of open park space. Construction of Creekside at Bethpage began in 2015 by premier builder AV Homes. The community will consist of 650 homes upon completion. Homebuyers can choose from five model collections: Publisher Edition, Star Edition, Great American Edition, Classic Edition, and International Edition. These elegant ranch-style homes range in size from 1,320 to 2,606 square feet. All homes offer two or three bedrooms, two or two-and-a-half bathrooms, and an attached two-car garage. A new series of townhomes are available that range in size from approximately 1,294 to 1,342 square feet with two or three bedrooms, two ore three bathrooms, and attached two-car garages. Buyers can choose from three floor plans that will incorporate the same great design features active adults have come to expect from AV Homes. Homebuyers will be able to customize their home with optional flex rooms and additional storage space. All homes will be Energy Star certified and will include spacious layouts, large master suites, inviting family rooms, gourmet kitchens, and sizable porches and patios. Home designs also include architectural styles like New Craftsman, Farmhouse, and Traditional. Residents living in Creekside at Bethpage will have endless options for social recreation and physical activity. The clubhouse will be the perfect place to mingle with neighbors, play games with family, or relax outdoors with friends. Homeowners will enjoy all of the sports courts available in the community that will allow them to start tennis, pickleball, or bocce ball leagues. They can join exercise classes, arts and crafts events, or gardening projects. As Creekside at Bethpage continues to grow with more homeowners, there are sure to be more activities, clubs, and events for residents to enjoy. Situated in the heart of Research Triangle Park, homeowners living in Durham, North Carolina will have easy access to Raleigh-Durham International Airport and some of the best medical facilities like Duke Medical Center. They will also benefit from living close to major universities for lifelong learning opportunities. Plenty of retail opportunities at Brier Creek is nearby as well as access to major roadways like I-40 and the 540 interchange. Creekside at Bethpage is the ideal 55+ community with great amenities and homes in Durham, North Carolina. Hemingway Hall - 13,000 Sq. Ft. There are plenty of activities available in Creekside at Bethpage. Here is a sample of some of the clubs, activities and classes offered here. A new series of townhomes are available that range in size from approximately 1,294 to 1,342 square feet with two or three bedrooms, two or three bathrooms, and attached two-car garages. These ranch-style townhomes feature Craftsman or Farmhouse elevations, open layouts, and covered porches. The Star Edition offers three models that range in size from 1,320 to 1,608 square feet. Homebuyers can find a home that has two bedrooms, two bathrooms, and an attached garage. The second collection is the Great American Edition. Homebuyers can select from four models that have between 1,660 and 2,043 square feet of living space. The Classic Edition offers four floor plans from which to choose. These single-family homes have at least two bedrooms and bathrooms. They range in size from 1,951 to 2,425 square feet. The largest homes are offered in the International Edition. They range in size from from 2,502 and 2,606 square feet. Three models include at least two bedrooms and bathrooms with an attached garage. A great place to live. Great neighbors, lots of activities including pickleball, which was a must for me. I think the prices were reasonable. Our agents Sue Frizell and Barbara Green were very knowledgeable and attentive to our needs. We've been here about 4 months and love the community. The house is well built and really quiet. We've met people from all over the country and have made lots of friends. Everyone is very nice and gets involved. There are loads of activities planned and the grounds are well kept. Creekside is about 5 minutes from tons of restaurants, movies and all the major stores. Best of all, we're 25 minutes from UNC, NC State and Duke which all offer many additional opportunities. We have lived in Creekside for five months and could not possibly be happier with our choice. Our neighbors are friendly and fun, and we love the feeling of living in a "small town" where neighbors help each other. We are highly satisfied with both the construction quality and the layout/features of our home. Having an array of activities and events to choose from has made it easy to get to know people in the community. We also love that Creekside is right in the middle of the Triangle, so it is convenient to get to events in Durham, Raleigh, and Chapel Hill. When we looked around at different 55+ communities, we kept coming back to Creekside because of the sense of community we perceived here. Our hunch was right, and we are so grateful to call Creekside home! My husband and I have enjoyed every moment living here. The activities and clubs are awesome with many choices every month to participate in. We love the "Meet and Greets" where you get meet your neighbors and start new friendships. There are wonderful walking paths where you can enjoy the scenery as you take a relaxing stroll. It is our "Home Sweet Home"! We have lived here for 2 years and love it! Best decisions we have ever made! Great amenities, wonderful, friendly neighbors and lots to do!! 55places.com is not affiliated with the developer(s) or homeowners association of Creekside at Bethpage. The information you submit is distributed to a 55places.com Partner Agent, who is a licensed real estate agent. The information regarding Creekside at Bethpage has not been verified or approved by the developer or homeowners association. Please verify all information prior to purchasing. 55places.com is not responsible for any errors regarding the information displayed on this website.